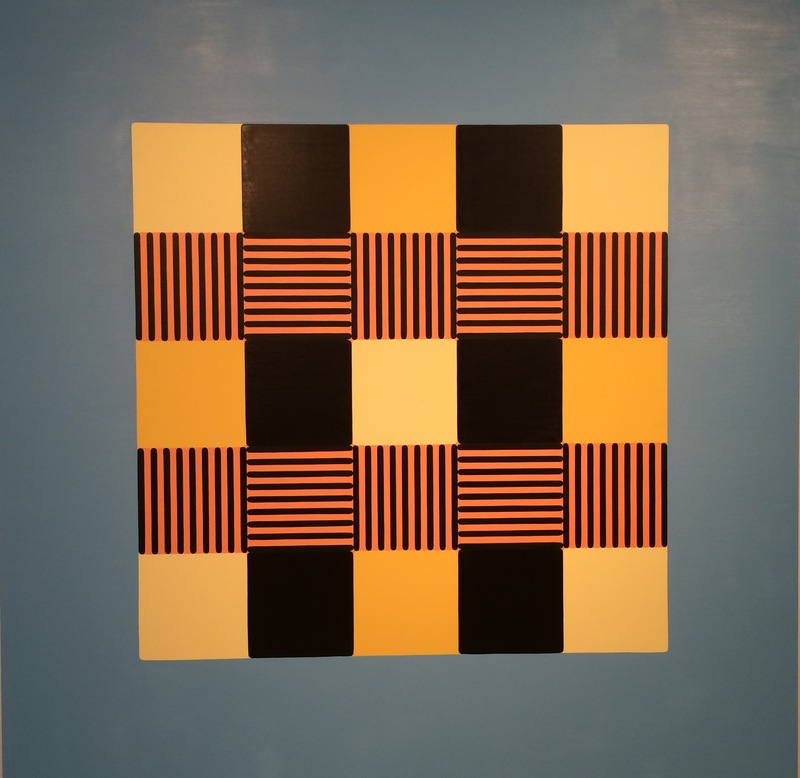 The Danese Corey Gallery is currently exhibiting the abstract geometric paintings of Warren Isensee. The artist uses a playful vocabulary of color to achieve an exciting sense of light. The straight edges are all hand painted without the aid of taping and Isensee uses adjacent colors that create enough tension that the work pulses with energy. The large square canvas “Dark Heart” provides an interesting perspective on the grid. Floating in a field of steel blue, the yellow black and red figure is made up of solid and striped squares. Alternating from horizontal to vertical of striped squares, the patterning draws the viewer’s eye to the two central horizontal bands. 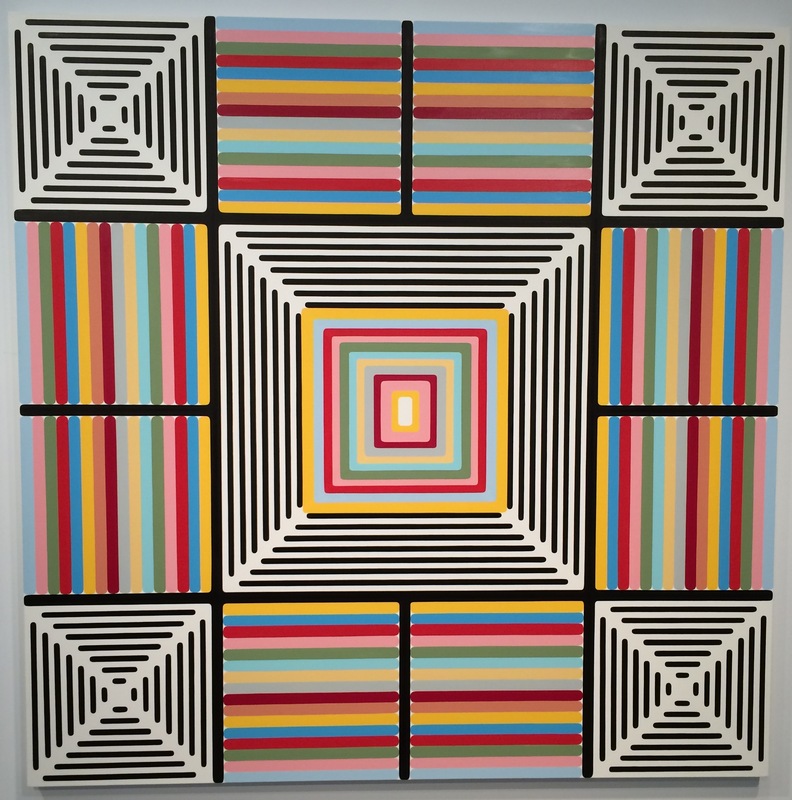 This work features both horizontal an vertical axises of symmetry through its center . “Surface Noise” offers the viewer an optical trick. At first glance it appears to have a nice neat four-fold rotational symmetry. The artist has painstaking created detailed elements of the composition that possess four-fold rotational symmetrical patterns. Only after close inspection you realize that the small center form is a rectangle and not a square. This painting has horizontal and vertical axises of symmetry, but it is not four-fold rotational symmetry. I think the slight deviation makes “Surface Noise” more interesting. It becomes a commentary on the visual expectations of symmetry.